With vessel arrival tonnage of 2.79 billion gross tonnes (GT) and container throughput of 36.6 million twenty ­foot equivalent units (TEUs), the Port of Singapore is one of the most active harbours in the world. But it is not just in the efficient management of cargo that Singapore excels. The marine hub is renowned for its infrastructure and talent, and efforts to develop its attractiveness as an international maritime centre. 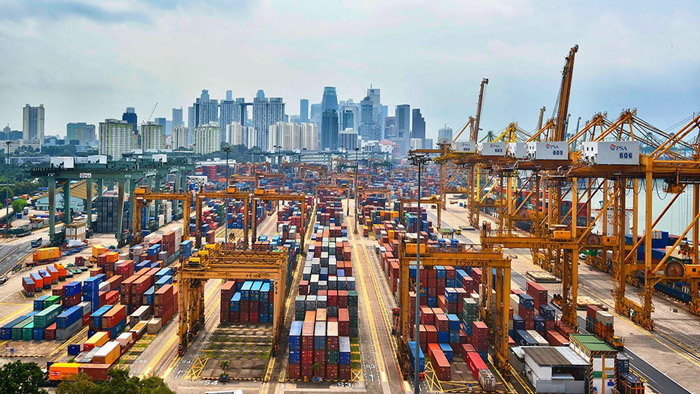 Singapore’s strive for excellence has once again seen it selected as the top maritime capital in the latest Leading Maritime Capitals of the World 2019 (LMC) report by DNV GL and consultancy firm Menon Economics. The report was unveiled during Singapore Maritime Week 2019 on 10 April 2019 and evaluates the performance of 15 maritime capitals. 200 maritime experts contributed to the appraisal, with assessment criteria including shipping, maritime finance and law, maritime technology, ports and logistics, attractiveness and competitiveness. This is the fourth consecutive time that Singapore has been ranked number one in the LMC report. However, despite their ranking, and the suggestion the region will continue to retain its world-leading position over the next five years, Singapore has vowed to sharpen their competitive edge with increasing efforts to drive connectivity, innovation and talent. At the 4th Singapore Maritime Technology Conference (SMTC) on April 10, Lam Pin Min, senior minister of State, Ministry of Transport & Ministry of Health announced that the Maritime and Port Authority of Singapore (MPA) will increase its focus in digitalisation over the next three years. The establishment of the Circle of Digital InnOvators (CDO) network in late 2018 will support those that require assistance to “kick-start their digital journey” and spearhead digitalisation initiatives in the maritime industry. Additionally, MPA will roll out the Sea Transport Industry Digital Plan (IDP) for the ship agency and harbour craft sub­sectors. The IDP is a partnership between MPA, Infocomm Media Development Authority (IMDA), Enterprise Singapore (ESG) and SkillsFuture Singapore (SSG) and will deliver easy­to­use, step­by­step guides on digital solutions for small and medium enterprises (SMEs) in the Sea Transport industry to support their ongoing growth.